While living in Korea, Sock It To Me’s Carrie Atkinson encountered some seriously funny socks. Turns out, bold, funky socks were a must-have prevalent in the Korean street style scene. Carrie was drawn to them, and we can see why. Besides looking outrageous, the colorful socks feel surprisingly soft and cozy, too. 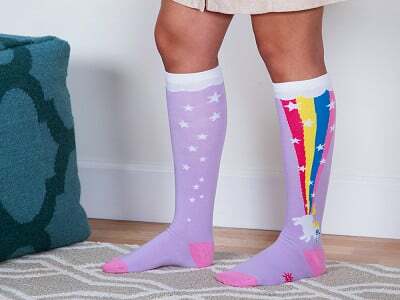 The knee-high and crew styles come in amazingly offbeat designs, like Tacosaurus and Catterfly, which you have to see to believe—and when you’re rocking socks with this much personality, you’ll want to show them off. Hello everyone! I'm proud to introduce Sock It To Me socks to The Grommet. I'd be happy to answer any questions you may have! Our socks are made from high quality combed cotton, polyester and spandex. 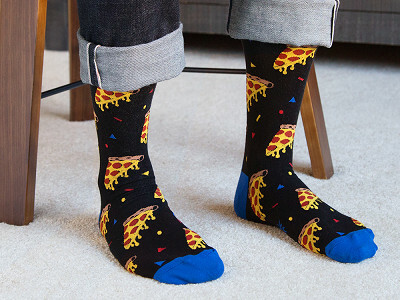 While living in Korea, Sock It To Me’s Carrie Atkinson encountered some seriously funny socks. Turns out, bold, funky socks were a must-have prevalent in the Korean street style scene. Carrie was drawn to them, and we can see why. Besides looking outrageous, the colorful socks feel surprisingly soft and cozy, too.